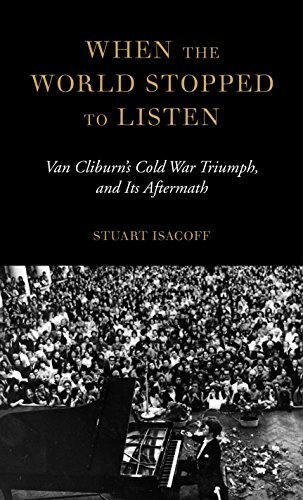 One of the pleasant interludes in the Cold War was the ecstatic reception that Van Cliburn received at Moscow’s first-ever Tchaikovsky International Piano Competition in 1958. Much to the surprise of those who believed the Soviets would allow only a Russian to win, Cliburn prevailed, winning the hearts and minds of Russian listeners with his playing of the Russian masters. Stuart Isacoff, a pianist himself and author of The Natural History of the Piano, has delved into Cliburn’s background, Moscow triumph, and its aftermath. He recreates what seems like a time so long ago, when Russians giants like composer Dimitri Shostakovich and pianist Emil Gilels were still alive and subject to the whims of the Kremlin. The U.S.S.R. was changing; Nikita Khrushchev, now Russian premier, sought to loosen the grip of Stalinism. As a people the Russians knew their classical music and revered great artists. The 23-year-old Texan, who despite his Juilliard background and an earlier win at a prestigious competition was hardly known in the United States, came to be called the American Sputnik—our cultural answer to Soviet outer-space supremacy. Although his career stalled after the initial spurt of bookings following his Moscow triumph, he was forever linked to a U.S.-Soviet thaw. Van Cliburn was the only son of Harvey Lavan and Rildia Bee Cliburn of Kilgore, TX. Rildia Bee was a piano teacher with a Steinway in the house that Van took to at an early age. When he showed unusual promise, he was sent to the Juilliard School in New York, where his teacher was the Russian-born Rosina Lhevinne. Once the Tchaikovsky competition was announced, she urged him to enter. Isacoff enhances his description of Cliburn’s time in New York and then in Russia with interesting touches. Although often thought of as a goody-two-shoes, Cliburn in fact was an adventurous fellow who would drink at night clubs in Harlem with friends. He also developed a form of performance anxiety that manifested itself as lateness—he arrived at his own concerts at the last minute and as he grew older, kept audiences waiting, sometimes for an hour or more. In Moscow, though he was on his best behavior, and in the final round began with a “perfect” performance of the Tchaikovsky Piano Concerto No. 1 with Kirill Kondrashin conducting the Moscow State Symphony. His version of the Rachmaninoff Concert No. 3, leisurely and lovely brought tears to the eyes of listeners. Says Isacoff, “Sometimes a performer experiences an instant of artistic grace, when heaven seems to open up and hold him in the palm of its hand. . . .” That, apparently was how beautiful Cliburn’s rendition sounded. Politics swirled around the decision between Cliburn and his closest competitor, the Russian Lev Vlassenko. Both Gilels and Sviatoslav Richter, another Russian master who was a judge, felt Cliburn should be the sole victor; others felt the two should share the prize. But the choice was ultimately in the hands of Premier Nikita Khrushchev, who chose Cliburn. It was April 1958 and the world suddenly regarded the boyish Texan as if he were a movie star. The story of his victory made the front page of The New York Times. When he returned to the U.S., he was given a ticker-tape parade down Broadway. Audiences loved him, and young girls screamed as if he were Elvis. As Cliburn’s fame spread, he signed with the impresario Sol Hurok and toured extensively. When he began tiring, he sought help from the notorious “Dr. Feelgood” Max Jacobson, who injected him and other celebrities—including John F. Kennedy—with amphetamines. He took a suite of rooms in New York where he lived with his mother, who became his road manager. Eventually, the Cliburn fad faded. By 1976 he found it hard to get bookings, and he retired from performing for nearly a decade. After one long relationship that ended in a nasty palimony suit, he did find lasting happiness with a younger man, Tommy Smith, who apparently gave Isacoff a rare interview. Smith described Cliburn as an “innocent—a kind of artistic Billy Budd” who could not totally cope with the real world. He did return several times to Russia, where he was always welcomed. He began a foundation that started an American piano competition similar to the Tchaikovsky one. Van Cliburn died at 78 in 2013. Isacoff’s well-researched book, along with Moscow Nights, a biography by Nigel Cliff published in 2016, assures that he won’t be just a footnote in the annals of piano artistry.